Days after resigning as Quartet Envoy, Tony Blair announces he will be chairman of European Council on Tolerance and Reconciliation. Former British prime minister Tony Blair is to take on a new role fighting anti-Semitism after stepping down as a Middle East peace envoy, he announced on Thursday. According to AFP, Blair will serve as chairman of the European Council on Tolerance and Reconciliation, which campaigns to stop discrimination against Jews as well as for Holocaust denial to become a criminal offense. Blair and Russian-born Jewish businessman Moshe Kantor announced the appointment in a joint article in newspaper The Times in which they warned of reports of rising anti-Semitism. 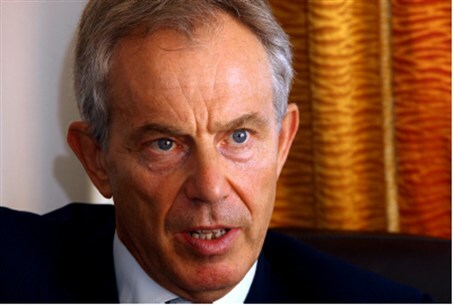 "Anti-Semitism is not a Jewish problem, but one infecting the whole of society and needs to be tackled for the sake of us all," Blair and Kantor penned. "States, international organizations and other actors must join together to tackle hate and intolerance. If we wait for our armies to act, it will be too late." Blair resigned last week as an envoy for the Middle East Quartet diplomatic group, representing the United Nations, the United States, the European Union and Russia. He had been working at the Quarter for eight years, attempting to help mend the Israeli-Palestinian conflict.